Scientists have attached cameras to large white sharks to reveal their astounding manoeuverability through densely packed kelp forests while hunting for prey. Previously, it was thought white sharks waited around the edges of kelp forests to ambush emerging seals because it was assumed the sharks were too big to enter. 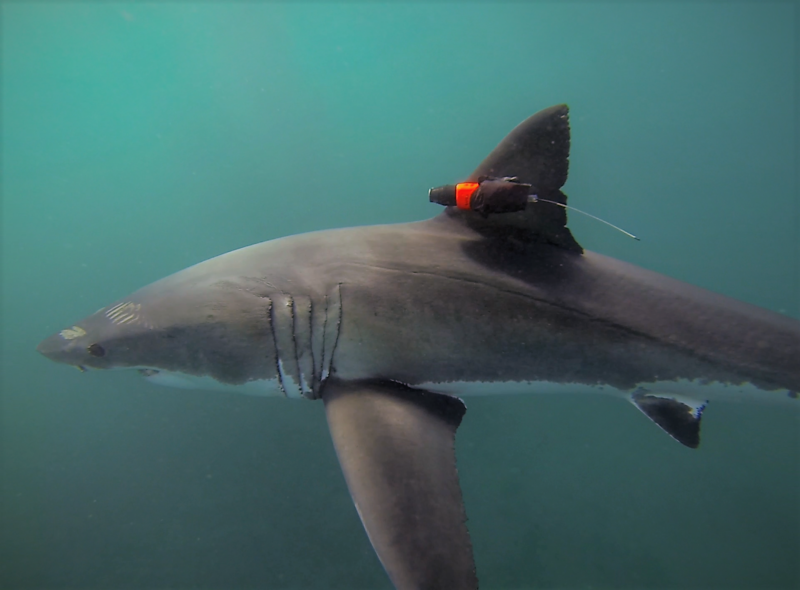 But the footage, collected from eight sharks tagged off the South African coast by a team including Murdoch University PhD student Oliver Jewell, show they are able to navigate through tight channels, and barge through large stipes and fronds. Mr Jewell, who is part of Murdoch’s Centre for Sustainable Aquatic Ecosystems in the Harry Butler Institute, said this behaviour had never been captured on camera before. “The film we collected gives us a new perspective on this species. We can see how they interact with their surroundings in real time, and they are able to make some pretty spectacular 180 degree turns in the kelp forest,” Mr Jewell said. Several Cape fur seals were also captured by the shark cams swimming through the kelp forest in the Dyer Island Marine Reserve. The footage shows them displaying predator evasion techniques such as blowing bubbles in response to the presence of the shark. But the 28 hours of footage collected did not capture any kills in the kelp forest, which may support findings that kelp provides refuge for seals. Mr Jewell said this behaviour might also be applicable to white sharks patrolling kelp forests off the coasts of California and South Australia, but more research was needed to confirm the behaviour. 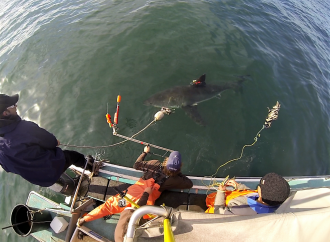 To safely attach the cameras, the researchers first needed to entice white sharks to their boat. They placed chum in the water and used a seal decoy to attract them close enough, so they could use a fishing rod-like device to carefully clamp the specially mounted camera and motion sensor on to their dorsal fin. Dr Taylor Chapple, expedition leader from Stanford University, has been studying white sharks for more than 15 years but the wealth of knowledge camera tags provided surprised even him. “At times we would have to spend many hours at sea, perched over the side of a boat to deploy these tags, with no guarantees to even see a shark. But the incredible data made it all worthwhile,” Dr Chapple said. 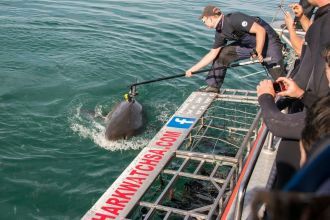 The tags were designed to stay on the sharks for a set number of hours before popping off and being collected at the surface. While invaluable, Mr Jewell said the footage collected revealed only a small aspect of a white shark’s behaviour. “We are really only scratching the surface with this study - there are so many layers to their behaviour. In the 12 years I’ve been studying them, it’s become clear white sharks have some very distinct behavioural traits,” he said.